Liquefied Natural Gas (LNG) is considered as an alternative fuel for shipping and a technically feasible option for compliance with the MARPOL annex VI revised requirements of 2020 (new sulfur cap 0.5% m/m sulfur). Nowadays more than 200 LNG powered carriers operate worldwide, while there are also several LNG carriers with dual mode engines which can operate with both fuel oil and LNG; an increase on these carriers is expected as we are heading toward 2020 and stringent environmental rules emerge in the market. Those in favor of using LNG as a fuel support that it is the most ‘green’ marine fuel for compliance with IMO 2020 and beyond, having also a competitive price in comparison with other compliant distillate fuels. On the other hand, there is a lot of discussion of LNG key challenges with respect to its impact on Greenhouse Gas (GHG) - mainly due to the release of methane emissions over the life cycle of the fuel – the relatively high investment costs and LNG bunkering infrastructure which is still under development. Also, there are safety concerns associated to low flashpoint and cryogenic nature of LNG. There are some semi operational terminals and some other planned to operate as for example Gibraltar, Dunkirk, Hamburg, Busan, Zhouzan. The IMO Res. MSC.285(86) and revised IGC code cover issues related to the use, carriage and bunkering of LNG as a marine fuel. Additionally, EMSA has issued a guide for LNG Bunkering to provide best practices for LNG operation to European Port Authorities. 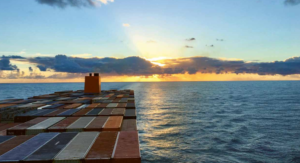 In this guide, EMSA notes that an increase in LNG bunkering activities is foreseen, with more ports offering LNG bunkering, also as a competitive advantage. Functional and technical requirements have been developed, assisting LNG bunkering operations with a procedural framework and with technical provisions for LNG bunkering equipment. LNG Bunkering procedure involves two main players. The provider of fuel, who may be barge, track or shore installation, and the LNG powered ship itself. As per IMO requirements the bunker station has to be under specific construction requirements and air / ventilation condition. Additionally the hose used should be LNG rated in order to support the transfer. Truck-to-Ship – TTS: LNG truck connected to the receiving ship on the quayside, using a flexible hose, assisted typically by a hose-handling manual cantilever crane. 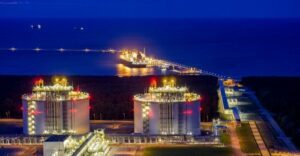 Terminal (Port)-to-Ship – PTS: LNG is either bunkered directly from a small storage unit (LNG tank) of LNG fuel, small station, or from an import or export terminal. ISO Container-to-Ship: LNG can also be delivered to the receiving vessel by embarkation of ISO containerized LNG tanks. 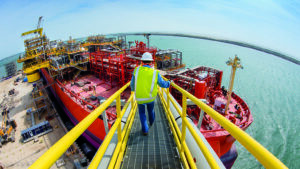 If the receiving vessel is pre fitted with LNG connections the fuel can then be used. Depending on LNG quantity needed and potential time constraints for the operation, it is possible that different LNG bunkering modes are more applicable to different needs. For example if small quantity of LNG fuel is needed Truck to ship method is more applicable or on the other hand if a great quantity of LNG fuel is needed an STS or PTS method is more applicable. The main safeguard during LNG bunkering is the on board and ashore Emergency release system. This system includes two other subsystems the Emergency Shutdown System and Emergency Release Coupling. Emergency Shutdown system will stop the LNG transfer, close shore ESD valve, onboard ESD valve. The Emergency Release Coupling is designed to allow hose separation when desired, as a consequence of a faulty, alarm or hazardous condition n LNG bunkering. As LNG bunkering is considered to a challenging operation, in case of additional activities, a SIMOPS (simultaneous operations) approach should be followed. Activities as passenger transfer, provisons/stores handling or cargo operations at the same time with LNG bunkering should be approached as a complicated set of operations in which the SIMOPS risk assessment is applicable.